The fast-paced life of today is increasing the stress levels of people at home or at work. 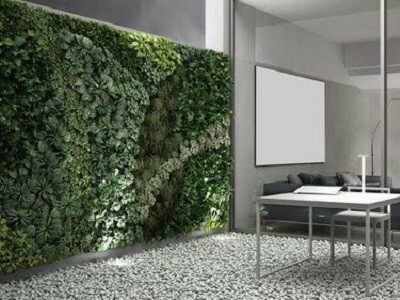 Though there are several stress-relieving techniques including medication and exercise, Evergreen Walls recommends indoor green walls as an excellent stress-buster in any environment. Living or artificial, green walls can help reduce stress. Here are some ways an indoor green wall can help you reduce your amount of daily stress. It’s a proven fact that greenery has a calming effect on the human mind. Regardless of the green wall being an artificial vertical garden or a natural one, a wall with plants is infinitely more calming than a bare wall. Some hospitals even use green walls to help calm patients and reduce stress. A natural living green wall with real plants has the capacity to remove toxins from the air as well as add pure oxygen to improve the quality of air in the room. Breathing in cleaner and better quality air could actually contribute to reducing stress by promoting better health. Even monotony in any environment can cause stress to build up. Therefore, invest in artificial greenery panels for the home or office to break up this monotony and improve one’s overall attitude and demeanor. An artificial vertical garden can be built up or modified over a period of time, further easing the boredom. Please call Evergreen Walls for some great options in artificial greenery panels and welcome a more stress-free life.